A time when men and women – young and old – were strong and courageous! How many people do you know who will stand boldly for what they believe regardless of other people’s opinions? Where are men and women who trust God in the midst of trials and conflicts? Are you one of them? The Book of Joshua tells the story of one man who was strong and courageous – a man singled out by God to lead his generation to victory and holiness. 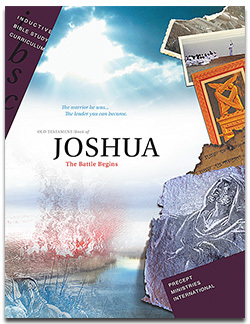 Students will discover that God called Joshua to fulfill His plan even in the midst of struggles and oppositions. How did he stand in the face of opposition? Where did he turn during trials and conflicts? What did he know about God that gave him the strength and courage he needed to be victorious? God is ready to lead you to victory as well. They too can know Joshua’s God! Consider how this knowledge can change lives!